Rich, smooth. 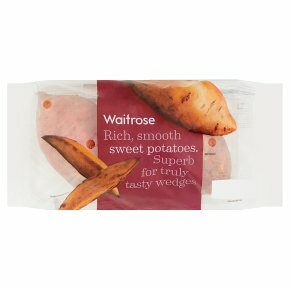 Superb for truly tasty wedges. Boil 15-20 minsRemove all packaging. Peel, dice and wash thoroughly. Place in a pan boiling water and cook until sweet potatoes are soft. Drain the pan and mash the sweet potatoes with butter and seasoning until smooth. Remove all packaging. Peel, dice and wash thoroughly. Place in a pan of boiling water, cover and bring back to the boil. Reduce heat and simmer for 15 minutes or until tender. Electric 220°C, Fan 200°C, Gas 7 20-30 minsPreheat oven, remove all packaging, peel, dice and wash thoroughly. Cut potatoes into even sized pieces. Parboil for 10 minutes. Drain then shake the pan to roughen the surfaces of the potatoes. Heat 4tbsp of vegetable oil in a roasting tin. Add the sweet potatoes and turn in the hot oil. Bake on the top shelf of the oven for 20-30 minutes, turning occasionally, until golden brown.